We provide in-home care to fit your schedule, whether it’s part-time, full-time, hourly, or overnight. Our experienced caregivers are CPR and first-aid trained and available 24/7. For family members, this is a great solution that supplements and / or alleviates your responsibilities at home, allowing you to work or even travel when you wish. It also serves as a great complement to home health or hospice when you need additional assistance. 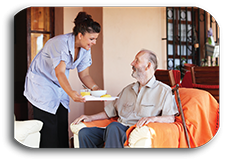 Services include in-home and respite care, nursing home or hospital sitting, and additional assistance to those receiving home health or hospice care. We provide a preliminary visit by our Care Manager to determine the general needs and the personal needs of the client. The General Needs and Personal Needs assessment forms are prepared, as well as the Home Safety Assessment. As a result of the above needs assessment, a Care Plan is developed. These is the basis on which our homecare will be offered. Once the needs of the client are evaluated, a caregiver(s) will be assigned by matching caregiver skills and experience to client needs. Other pertinent considerations, such as language, male or female caregiver, or caregiver experience and skill level, will be considered when caregivers are assigned. 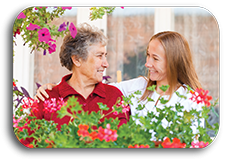 The Caregiver(s) will provide service based on the Care Plan. This activity will be subject to on-going supervision by the Care Manager, as required. The Caregiver(s) will maintain a log book, kept at the client’s residence, which tracks daily activities and caregiver observations. Elements of the log book will be transferred at the end of each caregiver’s shift to the Client Medication Record and Personal Care Flow Sheet, which will be maintained as part of the client’s log book until completed, and then transferred to the client’s file at CARE PLUS Nursing Services, Inc.
On a regular basis (monthly or bimonthly, as required), a Care Manager will visit the client by appointment to review the client’s current condition and needs, the records kept by the caregiver(s), and the performance of the caregiver(s). Caregivers may be re-assigned as needs evolve. We are always receptive to the inputs of both our clients and our caregivers. Home health services is clinical care ordered by your physician that takes place in the comfort of your own home. Our highly qualified clinicians and therapists will develop an individualized ‘Plan of Care’ with your physician to help you rehabilitate from medical procedures and/or help chronic conditions. With Skilled Care Services from Care Plus Home Health, you can stop worrying…. and start recuperating! A Clinical and Healthcare management expert with advanced degrees and significant expertise in working with seniors who leads our experienced nursing and therapist staff. Consistent care providers that ensure timely visits in your place of residence, whether your own home or a senior residence. Comprehensive and effective communication with our patients, their families and physicians and other members of their healthcare team. An uncompromising level of attention, customer service and integrity. Continued training that strengthens the skills and knowledge level of our care providers. Occupational Therapy: Increases the patient’s independence and ability to perform daily functions by teaching adaptive methods and the use of special equipment. Medical Social Worker: Helps the patient and the family problem solve social and financial problems that interfere with their ability to recuperate or stabilize their health issues. Home Health Aide: Assists the patient with activities of daily living such as bathing, personal hygiene, meal preparation, light housekeeping and home exercise programs. Hospital stays are very short today. You might go home before you fully understand your diagnosis; before you can handle your wound care by yourself; before you can get out of bed by yourself; or while you are still weak and unable to go to the doctor’s office for follow-up care. These are examples of when home health can provide a continuation of the care you received in the hospital, from nursing, therapy or aide services. 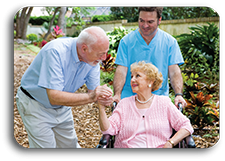 CARE PLUS Nursing Services Inc. is Orange County’s premier home health provider. We can ease your transition from hospital to home because we know what many of your questions and concerns are and have the answers. The first step is knowing that you, a family member or your doctor can call to arrange for home health 24 hours a day, seven days a week. CARE PLUS works with your doctor and you to develop an individualized care plan. We then put together a home health team of skilled professionals who work with you and your family to understand your condition, determine how many visits and what types of services you can expect to receive, and provide your care. The home health team may include a nurse, therapist, home health aide, social worker or nutritionist depending on your needs. The team may also include IV therapy to provide antibiotic therapy, pain control therapy or total parenteral nutrition. CARE PLUS can also provide and coordinate the delivery of home medical equipment such as wheelchairs, hospital beds and commodes, oxygen and respiratory equipment and supplies. If you need home health and live in Southern California, CARE PLUS would like to provide your care. Your safety, recovery and independence at home are our primary goals. You and your loved ones have a choice when dealing with chronic illness or a terminal diagnosis. If aggressive treatment or hospitalization is no longer your wish when suffering from qualifying long-term or life-limiting conditions, Hospice care provides you the option to approach end-of-life care with comfort, compassion and dignity in your own Home, Hospice Center, Skilled Nursing Facility or Assisted Living Facility. Who is eligible for the Hospice Medicare Benefit and how is it obtained? There is no limit on number of days one can receive hospice care. Hospice can continue to be given to a patient as long as the physician continues to re-certify the patient for hospice. Many hospices also provide care to uninsured individuals. To do so, they rely on donations to cover their costs. What is covered under the Hospice Medicare Benefit? Treatment to cure a patient’s illness as it relates to hospice: The philosophy of hospice is to provide comfort and care, including medication, which helps control symptoms and ease pain. Patients receiving treatments to cure their disease are not eligible for hospice care. Care from two hospice providers: Patients must elect to receive service from a single hospice care provider. However, the patient may change providers at any time. How long can a patient continue to receive hospice care under Medicare? The Hospice Medicare benefit is structured in benefit periods. The first two periods are for 90 days each, followed by an unlimited number of subsequent periods of 60 days each. The patient may revoke the hospice benefit at any time during a benefit period. The patient may then return to their regular Insurance coverage. The patient may later re-elect the hospice benefit. Can other Medical services be received while on the hospice benefit? Even though the hospice team includes a physician, patients can continue to use their personal physician for the treatment of health problems related to and unrelated to the life-limiting illness. When standard benefits are used, the patient is responsible for Medicare\'s deductible and coinsurance amounts. Hospice is not responsible for treatments unrelated to the life-limiting diagnosis or treatments that are not palliative in nature. What if the patient is currently covered under a Managed Care Plan (Secure Horizons)? The patient may use the hospice benefit and the managed care plan will continue to pay for medical care that is unrelated to the condition for which the hospice is providing care. There is no loss of coverage. What if the patient resides in a nursing home or an assisted living facility? 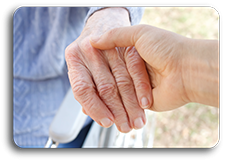 Hospice must have a written agreement (contract) with a nursing home to provide care. The hospice team and the nursing facility staff collaborate in your care. The patient will have the benefit of experts in long term care working with experts in symptom management and counseling to provide the highest level of care for the patient and family. Will the patient need to switch Doctors if they elect Hospice Care? What if I decide that I no longer want hospice care? You have the right to stop receiving hospice care at any time. A form is signed to revoke the Hospice Benefit and you go back to receiving all the benefits you had in the past from your Insurance. There is no penalty or loss of service days. What help is provided to help the family? 24 hour triage line: RN’s staff the Care Plus Hospice triage line. Nurse and Social Worker visit services are available 24/7 to meet the needs of our patients / families. Education and counseling for family members is covered. Volunteers are available as needed to provide chore type services and to make the caregiver\'s role easier. Home health aides assist with the patient\'s personal needs. Inpatient admission to a Skilled Nursing Facility for control of acute symptoms which cannot be cared for in a home setting is included. Inpatient admissions to a contracted facility for a brief period of time for respite care if the family needs a break from their home care responsibilities. Bereavement care is available to the immediate and extended family. Palliative care (pronounced pal-lee-uh-tiv) specializes in the relief of the pain, symptoms and stress of serious illness. The goal is to improve quality of life for patients and their families. Palliative care is appropriate at any point in an illness. And it can be provided at the same time as treatment that is meant to cure you. Palliative care is not a one-size-fits-all approach. Patients have a range of diseases and respond differently to treatment options. A key benefit of palliative care is that it customizes treatment to meet the needs of each individual person. Palliative care aims to relieve symptoms such as pain, shortness of breath, fatigue, constipation, nausea, loss of appetite and difficulty sleeping. It helps patients gain the strength to carry on with daily life. It improves their ability to tolerate medical treatments. And it helps them better understand their choices for care. Overall, palliative care offers patients the best possible quality of life during their illness. Palliative care benefits both patients and their families. Patient comfort is a main goal. So is support for the family. The team helps patients and family make medical decisions and choose treatments. It also makes sure they get reliable information. Palliative care is not the same as hospice care. Palliative care may be provided at any time during a person’s illness, even from the time of diagnosis. And, it may be given at the same time as curative treatment. Hospice care always provides palliative care. However, it is focused on terminally ill patients-people who no longer seek treatments to cure them and who are expected to live for about six months or less. Usually a team of experts, including palliative care doctors, nurses and social workers, provides this type of care. Chaplains, pharmacists, nutritionists and others might also be part of the team. Welcome to CARE PLUS Nursing Services Inc.
CARE PLUS is a family owned & operated company providing our clients guaranteed and reliable home care services in Southern California. CARE PLUS assures you the integrity of a professional & qualified team of caregivers to deliver the most personalized client centered services. Our mission is to provide your loved ones with the highest degree of care and to ensure that they receive the best quality of life. Become a part of our Care Plus family and receive a monthly update about our services. We never share your confidential information with third parties. We will only provide you with relevant notifications. Copyright 2014 © CARE PLUS Nursing Services, Inc. All Rights Reserved.